It's a joy and a shame that writer J. T. Krul came along to Teen Titans when he did. A joy, because Teen Titans: Team Building is a triumphant return to form for this title, a readable and respectable team the audience can root for. A shame, because Krul begins his run on the title just twelve issues before the book's relaunch with the DC New 52; I haven't yet read nor is this a commentary on the DC New 52 Teen Titans, but certainly the old DC Universe could have stood for Krul on Teen Titans a lot longer. Krul starts off Team Building with a radically pared-down team, which helps immensely. Since Infinite Crisis, Teen Titans has continually added members, from Geoff Johns's Red Devil, Ravager, Bombshell, and Wendy and Marvin Harris after the "One Year Later" jump, to Supergirl, Blue Beetle, Kid Eternity, Aquagirl, and so on. Of these, I'd venture the only one who really took hold was Ravager (maybe also Miss Martian), and Krul's roster is back almost to the earliest make-up of this team in this title, plus Ravager. Team leader Wonder Girl talks about building a more focused, accomplished team, and indeed that's what Krul has here -- every character feels to the reader like they deserve to be there. The Teen Titans team seems definitive again. Second, Krul dials down the angst level inherit in the title, while still not removing the angst completely. Titans lately has suffered from characters in overemotional fits of rage, melodramatic whining, and juvenile in-fighting. With Krul, these characters still don't completely get along, but Wonder Girl's animus with the violent Ravager is dramatically downplayed, as are Wonder Girl's concerns over her own leadership ability. Superboy and Wonder Girl have some romantic drama, ultimately breaking up, but Krul handles it in a more matter-of-fact, but moving, manner than the writers have before. When Superboy and Wonder Girl break up, we still like and feel for these characters, a key aspect that's been missing for a while. Further, Krul writes a pitch-perfect arc for new Robin Damian Wayne. It's perfect that at the end of the DC Universe, Red Robin Tim Drake should be the Titans' once and current Robin, but it equally makes sense that Damian should have some history with the group. Damian is thorny and unruly as always, with an undercurrent of desperate need for approval. Krul understands Damian can't get along with the Titans, but again mitigates this to avoid the adolescent sniping this title offered with Bombshell, for instance. As quick as the Titans are to undercut Damian, they're equally quick to give him a chance, and the gradual move from hatred to friendship between Damian and Ravager is especially endearing. All of this improvement in the Titans title far overshadows the book's shortcomings. There's not much of a villain in the book to speak of -- pitting the Titans against Headcase and the manipulated, misunderstood "Feral Boys" teenagers smacks of any number of previous Titans tales, from the Terror Titans to the DEO Orphans. Krul doesn't flesh out the bad guys nor make the reader care about them much, such that the villains are really besides the point in a story about the old Titans group getting back together; more interesting than the Feral Boys, for instance, is Raven's use of her powers against them. Also, though Krul succeeds in his characterization of Wonder Girl solely through his ability to write her as a cogent team leader and not a shrill harpy, the Wonder Girl solo issue didn't quite work. Krul portrays Wonder Girl as having an "overbearing mother," a departure from the Helena Sandsmark of the Young Justice days and not an improvement; to that end, Wonder Girl's conflict with her mother seemed forced and Helena's sudden acceptance of her daughter's superheroics equally baseless. Krul's new Titan, Solstice, also fails to connect. Kiran's sunny disposition is meant to reflect her light-based powers, but the character seems too boyiant for the reader to take seriously. Krul doesn't quite have a Mary Sue here, but it will take a lot to convince the audience that a devoutly cheerful Titan, perhaps meant to show the otherwise dour members the happier side of things, is a necessary addition. It's hard to see Solstice, like Ravager, becoming a lasting part of the Titans mythos. Again, however, none of that should give Titans fans pause for picking up J. T. Krul's Teen Titans: Team Building. Especially for any readers who deserted the title during its rougher moments, this is the time to come back. Team Building is mostly an exercise in set-up, putting the team in place by the book's end, and I'm eager for his final volume Prime of Life to see what Krul does with the team and how he brings this book to a close. 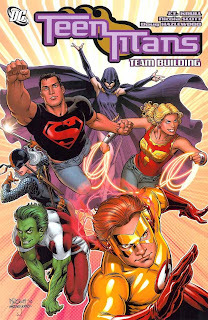 Teen Titans: Team Building includes a crossover with the Red Robin title; up next, we'll look at those issues from Red Robin's perspective with the Collected Editions review of Red Robin: Seven Days of Death. I completely agree with this review. After a long dry spell, Teen Titans became engaging and fun to read again. (I didn't connect with Soltice either, but that's a minor gripe.) I gave the relaunched TT a chance, but it just didn't come close to this quality. The comments at the beginning of this review bring up an interesting question. I'm working my way very slowly through a lot of what's on the DC Trade Timeline. Not everything, but a lot. Because of that it'll be a long time before I get to the new 52. Do you recommend that I read the new 52 trades as they come out or continue reading chronologically and wait until I get there? It seems like Green Lantern and Batman at least follow what came before enough to ruin things if I read out of order. I found the last 2 Teen Titans TPB quite enjoyable. We could certainly have done with more books such as Team Building and Prime of Life! You could read chronologically to the DC New 52, Dijon, for Green Lantern especially -- the break in Green Lantern is more a season finale/premiere than a continuity shift, and the same is sort-of true for Batman (Brightest Day before the New 52 Hawk and Dove trade is another). As for the other titles, you have to gauge your own interest -- personally I'd rather finish out the old Teen Titans, as I'm doing, before I start the new one, than start the new one and go back to old continuity. I'm not reading *all* the old DCU before I read *any* New 52, but I am trying to finish out old titles before new titles when possible. I agree; I've read some of the New 52 stuff (like Batwoman and Justice League), but only after I felt like I was "done" with those characters from the old DCU (that being said, Batwoman was basically a continuation of the earlier stories - not surprising, as it was originally planned to launch before the 52 reboot, and was delayed for that reason). I won't touch the new GL stuff until after I've finished Brightest Day and War of the Green Lanterns, and won't touch the new Flash until I've read Flashpoint. Meanwhile, I'll probably be reading Batwing soon, as I've already read Batman Inc.
Hey Collected editions! if i want to read teen titans, what trade book would you recommend starting with? When I read your comment, my first instinct was to say "Run, don't walk, to pick up Teen Titans: A Kid's Game," which is not only a fine story, but a finely-developed trade paperback -- no covers breaking up the chapters, unobtrusive chapter titles, all in all one of those perfect trades that reads like a graphic novel. But then I started to think. Johns Titans? Wolfman/Perez New Teen Titans? DC New 52 Titans? (Peter David Young Justice, even?!) Hm. Sounds like a topic worthy of its own post. Stay tuned. Thanks Collected Editions! Ill be waiting on that post!